Published on April 28, 2010 in Elections, General T&T, People's Partnership, PNM, Politics and UNC. 13 Comments Tags: Chamber of Industry and Commerce, Kamla Persad-Bissessar, Patrick Manning, Politics, T&T Govt. WHILE UNC political leader Kamla Persad-Bissessar last night said she is willing to take part in a live national debate with Prime Minister Patrick Manning in the run up to the May 24 general election, Manning, who is the PNM’s political leader, was reluctant to participate. “What do I have to gain, what do I have to gain from doing a debate with Mrs Persad-Bissessar? Nothing to gain, nothing to gain by that. That is all I could say, that is all I could say,” Manning told reporters during a walkabout in Tarodale Gardens, Tarouba. Enill is the PNM chairman. Prime Minister Patrick Manning has no intention of entering into any debate with Opposition Leader Kamla Persad-Bissessar before the May 24 general election. Chamber of Industry and Commerce president Angella Persad feels certain that national debates among political leaders will work in Trinidad and Tobago (TT), as they have in the United States and recently Jamaica. We respectfully invite Prime Minister Patrick Manning to review his remarks about bias involving this newspaper in the coverage of the current general election. Simply put – IS FRAID HE FRAID!!! What Mr Manning does not understand is that a debate is not meant to benefit him or Mrs Persad-Bissessar…it is to discuss the issues so the voting public can make an educated decision. A public debate is COMMONPLACE in DEVELOPED nations in the run up to elections. It is a forum in which candidates debate the issues and there is nobody to help them. It shows who is best fit to run the country. If the debate was to take place, I am sure he would lose as his “yes men” and bullies are not there to intimidate the voting public. His backing down from a debate shows that he chooses to keep people of T&T in the dark. What a coward!!! it is natural for a man to be afraid of woman’s mouth. I think a debate will let the general public decide who is best canidate to run the country.It is a common practice in the U.S of A for politicians to debate so why is the Prime Minister afraid.I think he has more to lose than gain that is why? I have tried to play the devil’s advocate and defend the man, but what am I to do now? After the mistakes made by the PNM over the past few years, I knew that it would be an uphill battle. It just continues to get worse and worse. And people still require proof that he is intellectually shallow? What is most informative is his saying that “I” have nothing to gain by debating; so this indeed appears to be about him. I could never have thought that I’d be listening far less concurring with Dr Morgan Job but the Emperor of Whitehall and his legions of yes people do indeed validate the man time and again. We are quite sure that the offer of the Chamber of Commerce to host political debates was sincere and non-partisan. But from the moment the initiative was announced, we were absolutely certain that Patrick Manning would refuse to take part. However, what we could not conceive were the contortions which Manning put himself through to refuse to rise to the challenge — becoming probably the only political leader in the western world to run from such an opportunity. Televised political debates began in the United States in the 1960 Presidential election, with John Kennedy and Richard Nixon publicly discussing their positions. These remained a feature in American politics for decades, before being adopted by other western democracies. And most recently, in the UK, a series of debates was held, featuring the leaders of the three principal political parties. One would have thought that a political leader like Patrick Manning, so consumed with giving his country the trappings of “developed country status”, would have embraced the opportunity to be part of a structured debate on the issues facing the country in this election campaign. But Manning, as we all expected, has declined to rise to the bait. POLITICAL leader of the United National Congress (UNC) Kamla Persad-Bissessar yesterday called on Prime Minister Patrick Manning to rethink his position on engaging her in a national debate saying such a debate is not about his personal gain but rather to allow issues to be ventilated on a national forum. United National Congress leader, Kamla Persad-Bissessar, last night called on Prime Minister Patrick Manning to reconsider his decision not to participate in a public political debate. People’s National Movement (PNM) chairman and Energy Minister Conrad Enill says PNM members will not engage in any debate with any Opposition member. If “not now” for a prime ministerial debate, before the electorate chooses the person and his/her party best suited and equipped to govern, can incumbent Prime Minister Patrick Manning tell the country when would be the most appropriate time for such a debate. ‘I have nothing to gain by that,’ said PNM leader Patrick Manning, in what was perhaps his most nakedly political admission on the campaign trail so far. Mr Manning was responding to a question from reporters on whether he would take part in a public debate with UNC leader Kamla Persad-Bissessar. Calls for such an event have come from the T&T Chamber of Industry and Commerce, a UWI student group, and the general public. WITH DISSATISFACTION over the failure of public affairs issues to take centre stage in the 2010 general election campaign, the most compelling aspect of the race has arguably been the role played by entertainers. yesterday i was confused all day! literally, all i could not function with this ‘I HAVE NOTHING TO GAIN’. THE PNM will not take part in any debates to be hosted by the Trinidad and Tobago Debates Commission, PNM chairman Conrad Enill said yesterday. 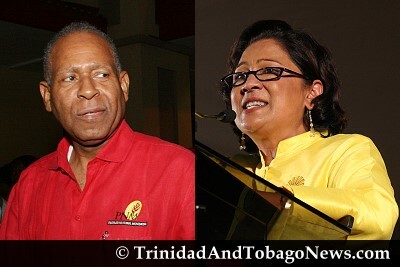 The PNM chairman’s comments bring to an end hopes of a possible live debate face-off between Prime Minister Patrick Manning and UNC political leader Kamla Persad-Bissessar. On April 27, Manning had said that the matter would be decided by Enill. However, he indicated that it was unlikely that he would take part. Why is PNM afraid of debate? Scratch one against the PNM for failing to take up the challenge to participate in a TV debate with the opposition alliance, which would have culminated in a face-off between Patrick Manning and Kamla Persad-Bissessar. The PNM should have stuck to the position first adopted by its political leader, Patrick Manning, that he did not stand to benefit from a face-to-face debate with his opponent, Kamla Persad-Bissessar. Manning is right!! What will the debate do for him. That nothing going to help hime win the elections. People already made up their minds. They cyah vote for that.